Newmachar is a village in the north-east of Scotland located within the Aberdeenshire local authority. Situated 10 miles (16 km) to the north-west of Aberdeen, the settlement has an estimated population of 2,510. The name originates from the original parish created in 1609, from part of the parish of St Machar's Cathedral. The name refers specifically to the village, originally known as Summerhill, with the surrounding parish being correctly known as New Machar. The philosopher Thomas Reid was parish minister from 1737 to 1752. In 1928, the name Summerhill was changed to Newmachar, which was also the name of the railway station serving the village. The railway station, on the Formartine and Buchan Railway, closed in 1965. During World War 2, Winston Churchill initiated the forming of a British resistance force called Auxiliary Units. These units were put together in top secret, and were selected from areas that could be used to benefit from guerilla warfare. Typically, these units (called patrols) were made up from farmers, gamekeepers and estate workers. Newmachar had one of these patrols that were tasked with destroying the main railways to Inverness, and the Buchan line to Fraserburgh and Peterhead, also RAF Dyce and bridges over the River Don. Research by C.A.R.T  has revealed the patrol members and also the location of the Operational Base. The Operational Base was built underground to house up to 8 patrol members who, when the Invasion came would go into hiding for 7–14 days before coming out at night to attack "targets of opportunity", including assassinations of key individuals (both local and enemy personnel). Aux unit members had a life expectancy of up to 2 weeks after an invasion. All the members had to sign the official secrets act, and were trained at Blairmore House near Huntly. Auxiliary units were well armed with the latest weapons and conventional and booby trap explosives. The local Newmachar Golf Club located just outside the village is noted for being the official golf course of Paul Lawrie at the time he won the 1999 British Open. It was also the venue of a hole in one in which the winner became a professional with a handicap of 24. This was because, to claim the 15k prize, he had to be a pro at the sport. The village was also the home to former Aberdeen FC player Neil Simpson who was part of the Aberdeen team which won the 1983 Cup Winner's Cup under Sir Alex Ferguson. The village is also host to Newmachar United F.C., who are affiliated with the Scottish Junior Football Association. The Newmachar Hotel has been named "Evening Express Pub Of The Year 2010". The Newmachar Hotel retained the title as Aberdeen's Best Pub, having won the last time the competition ran in 1993. 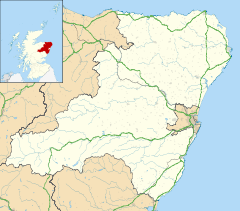 The hamlet of Brokenwind (or Brokenwynd) near Newmachar was named the UK's third worst place name in a 2012 poll. September 6th 2018, Radio 1 presenter Greg James managed to get a Cornish Pasty delivered to the village from Cornwall via Radio 1 listeners over the course of four days. ^ a b "Aberdeenshire Settlements - Population 2012" (PDF). nationalrecordsofscotland.gov.uk. Retrieved 8 October 2016. ^ a b Francis H Groome, ed. (1885). Ordnance Gazetteer of Scotland: A Survey of Scottish Topography, Statistical, Biographical and Historical. Thomas C Jack. ^ M.T. Dalgarno, E.H. Matthews, ed. (1989). The Philosophy of Thomas Reid. Kluwer Academic Publishers. p. 1. ^ "Formatine and Buchan Railway". www.railbrit.co.uk. ^ "UEFA Cup Winners' Cup - 1982/3". en.archive.uefa.com. Archived from the original on 2010-05-03. ^ "Scratchy Bottom beats Brokenwind, but Shitterton takes the prize... for unfortunate place names". 15 August 2012. Retrieved 6 January 2013. ^ "Pass the pasty with Greg James on Radio 1 reaches Aberdeenshire from Padstow". Cornwall Live. Cornwall Live. Retrieved 6 September 2018. Wikimedia Commons has media related to Newmachar. This page was last edited on 11 March 2019, at 20:09 (UTC).